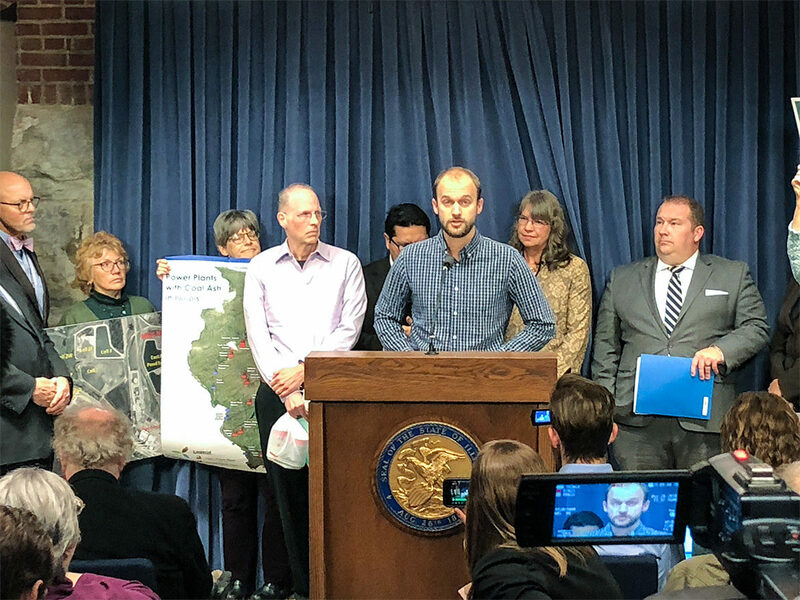 Andrew Rehn of the Prairie Rivers Network presents the report "Cap and Run: Toxic Coal Ash Left Behind by Big Polluters Threatens Illinois Water" in a packed room at the Illinois state capitol building in Springfield. 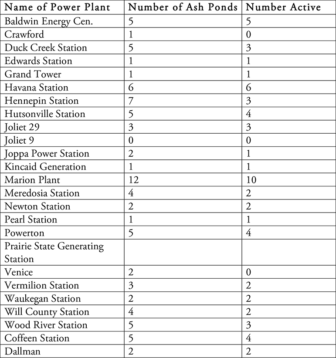 The report provides data on 24 Illinois coal power plants for which groundwater reports are available. Tests at all but two reveal contamination beyond federal and state standards. Coal ash is a mix of solid waste from burning coal. It contains unsafe levels of toxins like arsenic, boron, lead, chromium, and selenium, which are harmful to human health, fish, and wildlife. At most sites the ash is mixed with water and dumped into unlined pits. The report said that groundwater at the 22 sites had multiple contaminants in excess of state or federal water quality standards. The closed Dynegy coal ash storage site in Vermilion County by the Middle Fork River is one of the contaminated sites. The site contains 666 million gallons of coal ash in three ponds and leakage into the river is already apparent. Federal coal ash rules require groundwater testing at active sites still accepting waste. Results must be posted on public websites the companies maintain. The 45-page report, Cap and Run: Toxic Coal Ash Left Behind by Big Polluters Threatens Illinois Water, was published by the Environmental Integrity Project, Earthjustice, the Prairie Rivers Network, and the Sierra Club. Federal coal ash rules don’t apply to sites that were retired or inactive when the rules were made in 2015. 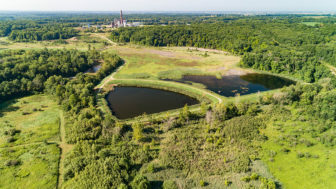 The gap in regulation means the public is in the dark about the oldest and most contaminated ash ponds – including many of the Illinois sites – and allows the sites to continue polluting groundwater. There are more than 1000 coal ash sites in the U.S., and at least 83 sites in Illinois. An interactive map of Illinois Coal Power Plants with Ash Ponds as of June 2018. Click a location to view details on ash ponds at each site, including owner, number of ponds, active/inactive, lined/unlined, contaminants, and more. Data was compiled by the Prairie Rivers Network from groundwater tests made public by the power companies, and open records requests. Map by Jack Brighton. For example, groundwater tests at the 60-year old Waukegan Generating Station show chromium levels of more than 480 times the Illinois groundwater quality standard, and arsenic levels of more than 2000 times the standard. Te report reveals the groundwater testing data from every Illinois site. Federal coal ash rules set standards for active sites. The rules require composite liners under ash ponds, and monitoring for potential contamination. But the federal rules don’t apply to many of the oldest and dirtiest sites, and enforcement is left to the states. After a 2010 statewide assessment of 24 Illinois coal power plants found widespread contamination, the Illinois EPA proposed more stringent state coal ash rules. But since March 2017 the process has been stalled at the Illinois Pollution Control Board. “The Agency has also been enforcing Illinois groundwater quality standards, which are equivalent to, or more stringent than, the federal national primary drinking water regulations,” the statement said. The coal industry is retiring many aging coal power plants. Many coal ash ponds have already been closed. Closure of ash ponds means the power company either removes the ash, or caps the ponds and leaves them in place. 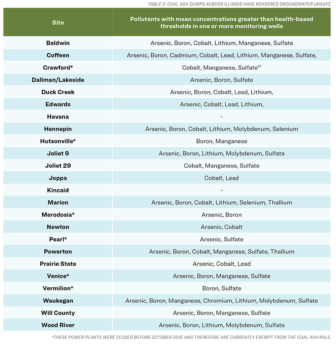 A summary provided by the Illinois EPA shows the agency approved 23 coal ash pond closures since 2011. Coal ash was removed from only one site. The other 22 ponds were capped with the ash left in place. Only four of the capped ponds have liners to protect groundwater. The environmental groups want a requirement for removing ash from all sites contaminating groundwater. They also want financial guarantees from the companies in the event of future damage, and a process for public input on closure plans. Since 1955 the Vermilion Power Plant has stored toxic coal ash in three ponds just yards from the Middle Fork Vermilion River near Oakwood, Illinois. The river runs through Kickapoo State Park, visited by more than a million people each year. They see the closure of the three coal ash ponds at Dynegy's Vermilion Power Station as an opportunity to test the commitment of state agencies to community concerns. Pollution from ash ponds at the site is threatening the Middle Fork, Illinois’ only federally designated National Scenic River. The riverbank is eroding rapidly under the ponds, increasing the risk of a massive spill into the river. Vermilion County officials, business groups, and environmentalists are worried that Dynegy is preparing to close the ash ponds by capping them in place. And they’re calling for a public hearing to voice their concerns to the agencies considering Dynegy’s plan. With more closures coming at coal ash sites at the Waukegan, Will County, Joliet 9, Duck Creek, Edwards, Havana, Hennepin, Powerton, Coffeen, Dallman/Lakeside, Newton, and Wood River power plants, those decisions will affect water quality for communities across Illinois.